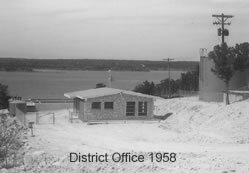 Water District 17 (WCID 17) is a non-profit public utility Water Control and Improvement District created in 1959 by order of the Travis County Commissioner’s Court, Texas, and confirmed by the voters within the initial District boundaries on February 28, 1959. The District is located west of the City of Austin in Travis County, Texas, and at creation encompassed approximately 4,500 acres of land. Subsequent annexations, including the annexation of the Steiner Ranch Defined Area in 1987, the Comanche Trail Defined Area in 1994, the Flintrock Falls Defined Area in 2000 and the Serene Hills Defined Area in 2008 have increased the service area to approximately 15,000 acres. Approximately 9,399 acres within the District, including all of the Steiner Ranch Defined Area, lie wholly within the extraterritorial jurisdiction of the City of Austin, Texas. The remaining incorporated acreage lies within the extraterritorial jurisdictions of the cities of Lakeway and Bee Cave.